Home Gadgets News Back-to-the-Same-Scene with LG Smart TV’s Time Machine! 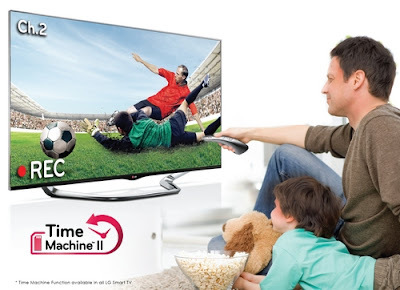 Back-to-the-Same-Scene with LG Smart TV’s Time Machine! Imagine a TV so smart and powerful you can bend time to watch your favorite shows. Consumer electronics giant LG reinforces its strong position as a global technology leader and innovator with a first-in-the-Philippines feature on its line of Smart TV models for 2013—the Time Machine. More details after the jump. “The Time Machine allows viewers to immediately record TV programs so that you can rewind, pause, or re-watch your favorite shows,” Jillian Lichauco, marketing communications manager of LG Electronics Philippines’ Home Entertainment division, explained. “This feature is ideal for office workers who can’t be home for their favorite soap or for entrepreneurs who have unpredictable schedules,” she added. The LG-exclusive Time Machine function is available in all models and sizes of its Smart TV line-up for 2013. Internal Recording - Records shows right on the TV’s built-in memory card. Watch and Record - Records a TV show while the user watches another channel. Scheduled Recording - Allows users to reserve a show that they will miss by scheduling a recording in advance. Live Playback - Lets viewers play, pause, rewind, save, and re-watch their favorite shows on an external hard drive. The LG Smart TV has an internal memory capacity equivalent to one hour of content. It has provisions for expandable memory ideally with a dedicated external hard drive (HD). The use of an external HD activates another unique LG Smart TV function, the Time Shift. “With Time Shift, the TV temporarily saves the currently watched show in the external memory. Viewers can rewind in real time while they’re deciding whether to record the show or not,” Lichauco said. All recorded programs are covered by copyright protection wherein only the recording device can play back the content. Viewers can also easily alternate from 2D and 3D viewing on the same TV. To find out more about the Time Machine and other features of an LG Smart TV, just visit www.lg.com/ph or www.lgblog.com.ph.